Free Printable First Day of Fifth Grade Sign. Free Printable First Day of Fifth Grade Sign. I just wanted to do first day of school signs for my kids that start Kindergarten and Fifth Grade respectively for 2017-2018 school year and searched for some ideas. This was the first time making this type of sign and considering I am a novice the result is not bad at all so I decided to share them with you. I ended up making all from Preschool to Twelfth Grade. If you like this practice design you can use it to start school on August or September with a nice photo to remember. Use a 8.5 x 11 photo frame or trim it to fit on a 8 x 10. Download Free Printable First Day of 5th Grade Sign now. Download is for 2017-2018 image. Not the 2018-2019 version in the thumbnail. Sorry Jack, I missed that one the day I was updating the First Day of School Signs. 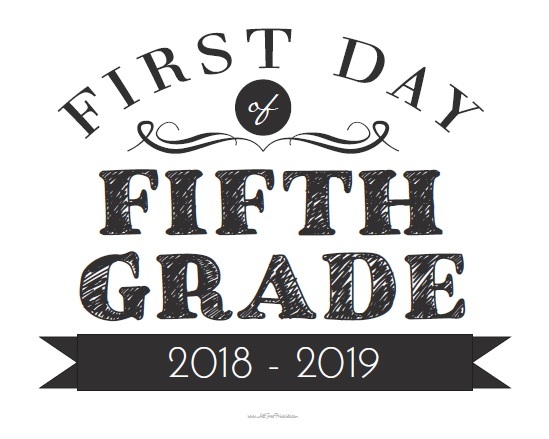 Now First Day of Fifth Grade Sign is available to download for School Year 2018-2019. Thanks for the comment.